With the rave of Project Life all over the web, blogs and facebook, I thought I would share with you my rendition of project life using SinCity Stamps. 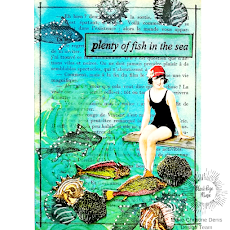 Anyone that knows me knows that Graphic 45 is one of my favorite paper lines and they have a fabulous calendar collection but with that being said I love to use stamps on my scrapbook projects as well as cards and alter projects. began my project by spraying 3 different Dylusion Spray onto white card stock, once it was dried I placed it on top of a 5x7 piece of chipboard. I stamped my background "Wings Above the Rest" SinCity Stamps to the top with black Stazon Ink. I used a stencil and modeling past on top of my project once it was dried and allowed it to dry completely before finishing it. While my project was drying I stamped the world hot air balloon from the "Wings Above the Rest" Stamp Set and colored it in with Copic Markers. Here is a closer look of the stamps from the "Wings Above the Rest Stamp Set" along. I enjoy layering my pieces so I did a couple of hot air balloons and placed them together with pop dots, added a "Wish" embellishment and piece of red twine.